for cleaning processing equipment, walls and floors. Food Industry- foam or pre-soak with dilution at 1 – 5% concentration. Removing paint- Remove excess grease and oil prior to application. Use at 10 – 20% concentration at room temperature to 85°F. 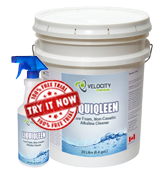 LIQUIQLEEN is safe on all types of metals if used as directed.